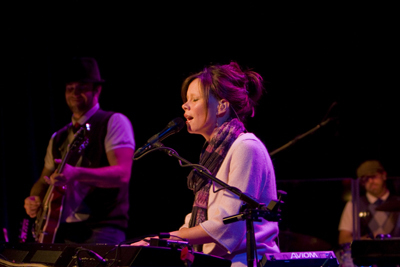 A breath of heaven, to use one of her lyrics and song titles, is an accurate description of a Sara Groves concert. Complex in arrangement yet simple in message. Multi-faceted in content yet singular in substance. Overwhelming in capacity yet simplistically focused in effect. The message, the music, the art is untainted, innocent, and virtuous. Sara’s ‘O Holy Night Christmas Tour’ recently made a stop at the Cup ‘O Joy in Green Bay, Wisconsin providing two shows to capacity plus crowds. The tour included selections from her ‘O Holy Night’ Christmas album and her recently released ‘Fireflies and Songs’ album. As always, the Dove nominated musician gave of herself without reserve. On many levels a Sara Groves concert is a family affair. Sara’s husband opened the concert with an ice breaker to pull the audience into the event. The opening song ‘It’s True’ had son Toby Groves providing the opening lines to the song. The band, a family of its own, contributed on many levels. The ‘O Holy Night Christmas Tour’ set list included new songs providing a window into everyone’s everyday life with ‘Setting Up The Pins’ to a view of Sara’s childhood in ‘This Old House’. Holiday tunes included the comedic ‘Toy Packaging’ with Troy’s mix of percussion from an electric drill drilling to boxes banged on to a hammer hammering, and a medley / sing along of ‘Silent Night’ / ‘Away In The Manger’ / ‘Come All Ye Faithful‘/ ‘He Alone Is Worthy’. Throughout the set, synchronized video ranged from cartoons, to old family still photos, to lyrics for audience participation. Long time band member Melody Olson shared two songs from her upcoming debut LP including ‘All These Things’ and ‘Keep Me Close’ with Sara providing harmony. The concert concluded with a customized version of ‘O Holy Night’ with melodic percussion, the unmatched harmony of Sara and Melody, flowing acoustic guitar, and a band / audience a cappella version of ‘Go Tell It On The Mountain’. As the concert house lights went up the audience felt a true sense of community with the very real people contributing to this band of musicians. Having shared her personal life and discipleship one feels the truth and peace given freely in Sara’s offerings. A crowd favorite – yes. A wonderful story teller – yes. A memorable night and a wonderful Christmas gift – most emphatically yes.